$900,000 for a 3-bedroom ... in Haiti? 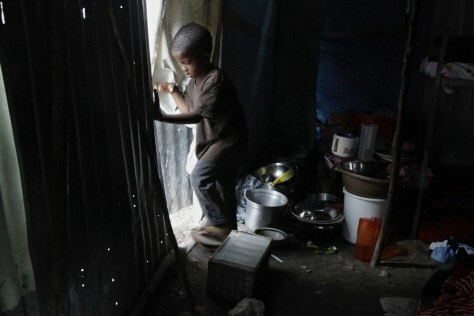 Stuard Lucner Tombeau, 4, exits his temporary home in a refugee camp in Port-au-Prince, Haiti. Haiti's brittle housing supply was shattered by the Jan. 12 earthquake, which destroyed an estimated 110,000 homes and apartment buildings. Since then demand has soared, as the more than 1.5 million people who lost their homes compete for new ones at the bottom end of the market, and a rising tide of foreigners from the U.N. and aid groups flood in from the top.